Nanakuli, or “to look at the knee,” is a 40-acre park named after the town of Nanakuli. Local residents call the south end of the sand beach fronting the park Zablan Beach for the Zablan family who has lived nearby for many years. Benjamin Zablan, the first member of the family to move to Nanakuli, made his home behind the beach next to Nanakuli Stream in 1916 when Governor Lucius E. Pinkham appointed him district magistrate of Waiʻanae. Zablan held the position for four years, traveling on horseback from courthouse to courthouse. During the early 1920s, when the land adjacent to the beach was offered for Hawaiian homesteading, Zablan moved his family to a homestead lot. As other homesteaders moved into Nanakuli, they began to call the beach Zablan Beach. When the City and County of Honolulu acquired the beachfront property behind Zablan Beach for a beach park, they called it Nanakuli Beach Park. In February 1940, however, the people of Nanakuli petitioned Mayor Crane and the Board of Supervisors to rename the park Kalanianaʻole in honor of Prince Jonah Kuhio Kalanianaʻole, the beloved “father of the Hawaiian Homesteads Act.” The request was approved unanimously. On March 26, 1940, the anniversary of Kuhio's birthday, a huge luʻau and a hukilau were held as part of the opening ceremony. 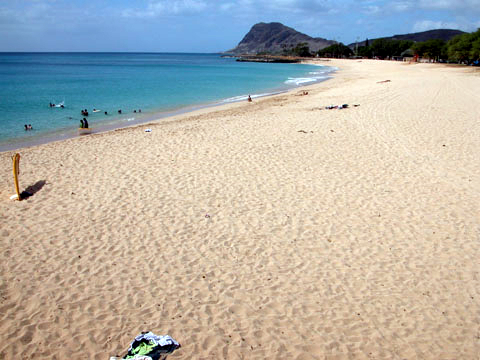 During the 1970s, however, the name was changed again to Nanakuli Beach Park. The beach fronting the park, a wide pocket of sand about 500 feet long and 125 feet wide, lies between two limestone points. The beach is subject to high surf and strong currents, especially during the winter and spring.